Zliz's EverQuest Compendium is a complete resource for information about EverQuest 1. 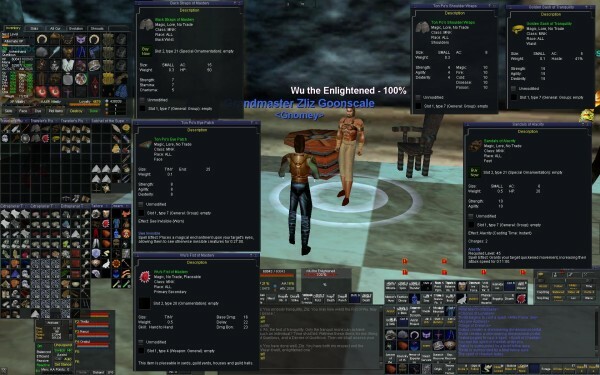 On the site you will find information about getting started with EverQuest, the mechanics of the game, technical reference, and much more. The site is a work in progress, and will be updated with new content as time goes by. Welcome, or welcome back! :) EverQuest is alive and well, and being actively developed. Join or re-join the world of Norrath and experience a vast amount of content in a solo- and casual-friendly setting, yet with many brutal aspects of the ancient EverQuest retained. If you're already schooled in the basics of the game, take a look at any of the articles in the menu on the left. An update (version 7) to my Classic EQ map tool ZlizEQMap, particularly useful for Project 1999, has been made available. It now includes a Plane of Growth map plus many previous fixes and features. It's no secret that I'm a big fan of The Plane of Sky. Over the years I have gathered all the keys, slain all the bosses, completed every Monk quest up there, not to mention visited it countless times for epic quests. When a lonely player in general chat asks for help in Sky, I'm always there to help. All Monk quests in Sky completed. The more mirrors the better, so this treasure of a guide can be preserved. The keys now go on your keyring the first time you use them. You now retain your buffs upon teleporting into Sky, making it more tolerable to do a casual visit. As an additional note, while certain bosses still Death Touch, don't let that scare you off if you're a high-level player. A Death Touch is the spell Cazic Touch, which does 100,000 damage. With the Spell Shield Mod2, which maxes out at 35%, a player will take 65,000 damage, which is easily obtainable at level 90+ depending on gear and buffs. That's right, you can just eat the death touch and carry on. ZlizEQMap is a map tool mainly designed for servers that emulate old versions of EverQuest. It features a local database of maps from the old EQAtlas website, along with player positioning (x plotted on map), transparent overlay, waypoints, zone connections, and more. It has been made for Project1999 and The Al'Kabor Project. ZlizUI is my EverQuest (Live) UI project; a minimalist and sleek UI. Furthermore, the Zone Level Chart has been updated with a list of zones no longer in the game, at the bottom of the page. Remember Oasis of Marr? Teleports & Travel - Major update with a myriad of methods of travel within the game world, including guild hall teleport, clickies, potions, AAs, boats, wayfarer camps, anchors, teleport spells, translocators, and more. Epic 1.0 - Now has a full overview of all the epic 1.0 quests. Tips & Tricks - Updated with some more tips, such as how to multibind and toggle the old character models. Music & Graphics - Updated with full instructions on how to play the old MIDI (actually XMI) music on your modern computer, sounding as they did back in the day. Buffs & Debuffs - Updated with information about how to block beneficial spells (buffs) from landing on you. Potions - Updated with some useful Alchemy-crafted potions. Spell Casting - Now has more details about spells, for example skills and specialization. In addition, a search box (Google Custom Search) has been added in the top left. Try searching for something, for example 'teleports' or 'macros'. I'm still working on customizing the results page, as its color theme doesn't really fit the rest of the page, but its core functionality should help you find stuff you're looking for. This site has been a project of mine for a while, and is now online. I have a ton of articles in the pipeline, which will appear in the menu on the left as they get finished over time.